This was one of the very first Spoons outside London and in the North, probably been open 20 years or so now (and it shows). Otherwise agreed with the last comment, though I wouldn't criticise the quality of beer or most of the staff, it always has a desperate feel to it to me especially for the centre of a place like Chester. 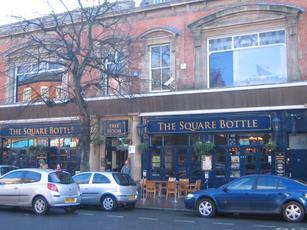 This is always my first stop when I come to Chester and is one of the better Wetherspoons. They always have a LocAle such as Peerless or Spitting Feathers and the service is always a lot quicker than other 'Spoons. However, on my most recent visit last week I waited a while to get served (person before me spent ages ordering food!!). When I eventually got served I asked for a pint of the delicious looking Conwy Brewery Honey Fayre. "Sorry, it's gone!" was the barmaids reply. Well turn the bloody pump clip around then. Do Wetherspoons train their staff to NOT turn the clips around if the beer has run out!? Anyway, I settled for a pint of Conwy Brewery Rampart which I think cost �1.89 so I was happy in the end. This pub has improved a lot over the last few weeks, thanks to the new manager(s). Customer service is noticably better with quicker bar service. Excellent beer quality and choice (usually 6 or 7 guest ales) and customers are encouraged to request their favourite beers. There is currently a 50p per pint discount for card-carrying Camra members. I shall continue to spend my beer allowance at this pub! Usual Spoons pub. Had steak and Chips. The steak was good but the chips were of the instant mash variety, just mush inside. The first 2 beers i asked for had run out so not a good start there either.